What’s A Normal Worry and What’s Not? Everybody worries at times. It’s normal to worry about things like school, how you look, what you said or did in a certain situation, how your parents will react to something you did or what the future will bring. That’s part of being a human being – especially, a teen. But OCD takes worries and doubts to the extreme. Let’s get down to what may be really bothering you. Everyone has worries and doubts — it’s part of being human. But OCD takes worries and doubts to the extreme. Maybe you’ve had an unwanted thought that worries you – or embarrasses you. Like if you wanted to hit your brother or sister really hard if they were especially nasty to you. Or you thought about what would happen if you suddenly blurted out a swear word in school or (worse yet) in church! As bad as these thoughts may seem, it’s not abnormal for “bad” thoughts to come into your mind now and then. It happens to everyone. Or maybe you started noticing that everyone in class seems to have a cold or a virus. They cough and sneeze without covering their mouths and never seem to wash their hands. You just “know” you’re going to get sick. Well, give yourself some points for noticing their bad manners – that kind of germ-spreading is just plain gross. But if the “bad” thoughts about hurting someone or the fears about germs keep coming back, are getting worse and worse, or you’re really stressed out that you might do something bad or that you can’t stop washing off the germs, then it’s time to have a talk with your parents and let them know you’re concerned. Don’t worry if your parents don’t really understand what you’re talking about; they may not know about OCD. Just hang in there and try to be as patient as you can so you can all work things out together. With OCD, you can’t get the thoughts and worries (obsessions) out of your head, and the things you do physically or mentally to try to make yourself feel better (compulsions, or rituals) take up a too much of your time and energy. Unfortunately, no matter how many times you do the rituals, you only feel better for a while. And the more you do the compulsions, the obsessions only seem to get stronger. An obsessive fear of being contaminated by dirt, germs, viruses (or any number of other things like chemicals or blood) that can result in compulsive hand washing, body washing, or even cleaning your room or the home you live in; avoiding touching others or shaking hands; avoiding public places. An obsessive uncertainty about something or fear of harm (to yourself or others) that may result in compulsive checking to make sure that doors or windows are locked or appliances are turned off. An obsessive fear of loss (or losing something important) that may result in compulsive hoarding of various objects (that is, you keep them and just can’t get rid of them). Sometimes these are useless items (like scrap paper, broken shoelaces, used paper cups – you get the idea). Sometimes you hoard things you think you might need some day – clothes you’ve grown out of, old newspapers, leftover food, old school papers – you can probably think of lots of examples. An obsessive fear of breaking religious rules or sinning that may result in compulsive praying, confessing sins or believing God is mad at you. This is called Scrupulosity. Some people with this condition have to repeat the prayer until they get the wording “perfect” and, if interrupted, have to start praying all over again. An obsessive need for symmetry that may result in a compulsive need to constantly “even up” or arrange objects in a certain order. An obsessive need for perfection that may result in compulsively seeking reassurance, or compulsive revisions (including revisions to school work) so things are “perfect.”. Remember that instead of getting weird or scary thoughts, OCD sometimes makes you have certain urges or feelings that you “have to do” something until it looks, sounds, or feels “just right” or “just so.” So at school, you may have to get in and out of a chair a bunch of times until it feels “just right.” Or maybe you have to keep arranging things in your desk until they look right. Maybe the way your mom said “Good night” wasn’t right, so you have to keep asking her to say it until it sounds right. You might even just have an urge to tie and retie your shoelaces until it seems OK to stop. The majority of teens with OCD are able to function reasonably well, and friends or teachers may not even suspect there is a problem. But when symptoms worsen, it’s time to get help. Treatment works. Read personal stories of successful OCD treatment. If any of the examples sound like you, it doesn’t automatically mean you have OCD. You should talk with your parents, your doctor or your teacher, though, because these fears and worries are getting in the way of a normal adolescent life. Don’t be embarrassed – it’s a good thing that you’re noticing what the problem seems to be and are asking for help. Your family doctor, or possibly your school, can help you and your parents find a mental health professional who can use some easy assessments to find out if you have OCD, or have any other disorders. And above all, there really is hope. 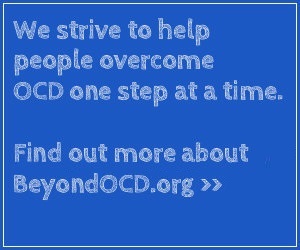 Effective treatment is available for OCD and for other disorders, so you CAN get relief.